Three wannabe journalism students follow a man in a ghille suit into the woods to find out what’s been killing local hikers in the mountains of Norway. It’s dark, we’re tethered to the first-person POV of the cameraman, and various flashes of light blast in the darkness, followed by faraway growls. The woods come alive with the crashing footsteps of something ahead. It’s the man in the ghille suit, running quickly away from the battle, stopping briefly to announce to his tag-a-longs: “TROLLS!” It’s a ludicrous moment, but taps into the simultaneous display of comedy and anxiety in Troll Hunter, one of the best genre films of the year. Written and directed by André Øvredal, this tale of students following a game warden for the trolls (in essence) not only takes these fantasy beasts out of obscurity, but realistically places them within contemporary society. Norway’s sprawling mountainous terrain is the home for various troll groups, and it’s when they go off the reservation that the troll hunter is called in to take care of them. These days it would almost be a sin not to reference The Blair Witch Project when discussing a found footage, faux-documentary, first-person POV film, and along with recent cousins of the genre Cloverfield and The Last Exorcism, Troll Hunter easily places among the sub-genre’s pantheon. Similar to the creative production of last year’s Monsters, Øvredal uses the natural topography of Norway for narrative purposes, cutting to mundane power lines and images of boulders and integrating them into the fantastic troll mythos. Form alone, however, is not enough to float a film, and fortunately for this project they were able to get Otto Jespersen to portray lead character, the troll hunter. Gruff and to the point, Jespersen guides us both through the history of the trolls in Norway, the government bureaucracy created to manage them, and the mountains of the country. Throughout this journey he’s also peeling back the layers of this woodsman to reveal his pity for the dumb beasts. It’s a tall order to realistically craft a character who feels remorse for slaughtering families of hideous, Christian chewing beasts, but Jespersen pulls it off with incredible sensitivity. Without Jespersen there’s no movie, and he handles the responsibility with finesse. The rights for the U.S. re-make have already been snapped up by Chris Columbus’ production company 1492 (Columbus is set to produce), and though Let Me In, the U.S. re-make of Let the Right One In, was a surprisingly solid re-make, there are too many things tying Troll Hunter to Norway that won’t translate to a U.S. audience. The U.S. doesn’t have its own rich folk history of troll tales, and the lush, mountainous Norwegian landscape plays a huge role in Troll Hunter. Not to mention, I doubt a Columbus produced Troll Hunter re-make would include the same R-rated material that makes the beasts so intimidating. They’re towering, ghastly things that bite the heads off their prey, especially sensitive to the blood of any Christian folk nearby. It’s much more in line with the Grimm’s Fairy Tales than the bloodless Disney tales of U.S. tradition. It’s not all drama and silly scares, as the film has its fair share of humor and charm. Farting trolls, whimsical pseudoscientific explanations, and a simultaneously hilarious and dread-inducing reveal toward the end will have you giggling throughout. Though the CGI isn’t perfect, the crew obviously try to hew close to as much practical effects as possible, and despite the digital wizardry, the ghastly visages of assorted trolls and the frightened reactions of the cast will have you holding your breath with anticipation. 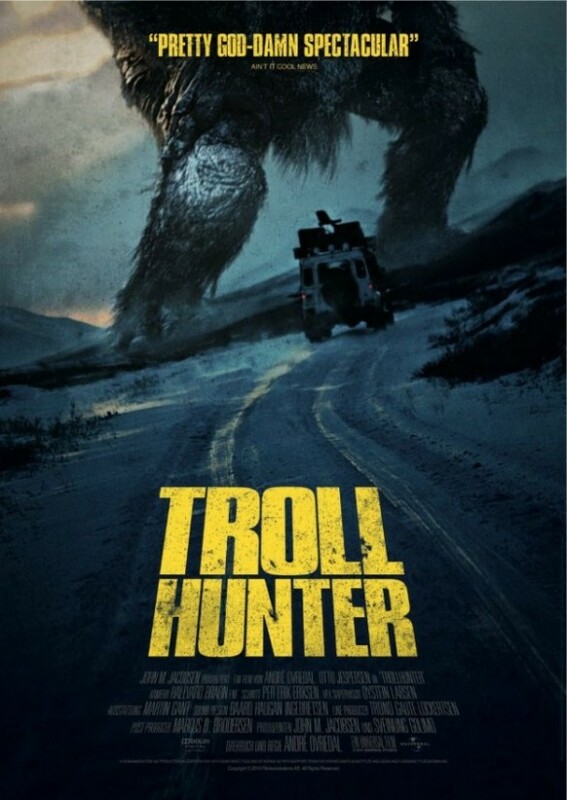 Easily one of my favorites for the year, check out Troll Hunter. This entry was posted in Reviews and tagged Comedy, Horror, Norwegian, Troll Hunter, Trollhunter. Bookmark the permalink.